Want to look and feel better while naturally boosting your metabolism? Then this is the pack for you! 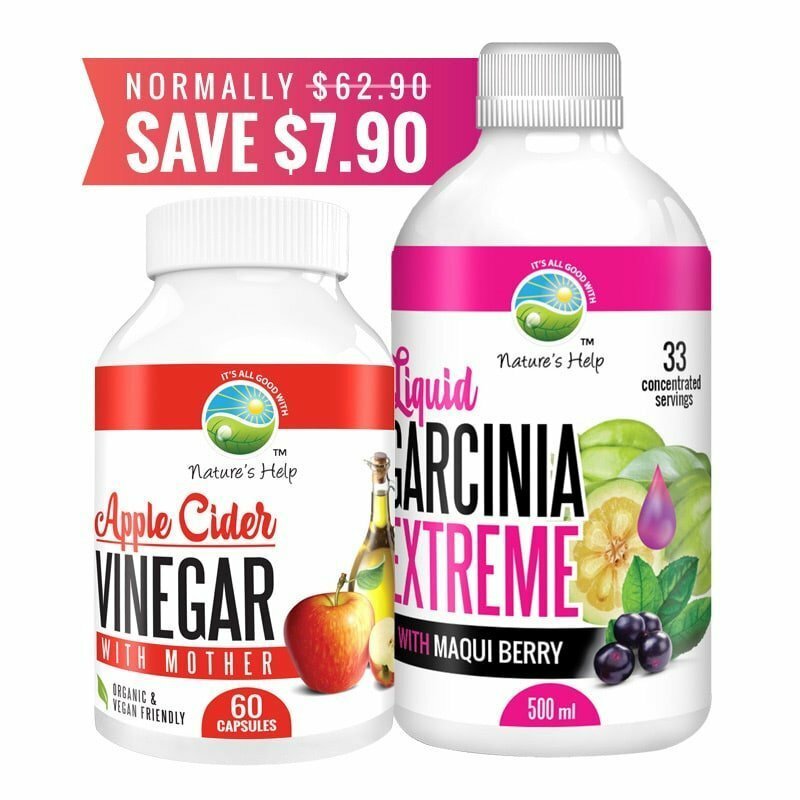 60 Organic Apple Cider Vinegar Capsules PLUS 500ml Garcinia Extreme Liquid. Most of us know there are many benefits to taking Apple Cider Vinegar, the problem is not all of us can stomach the strong pungent taste to it. This often results in us only taking it for short periods of time, diluted in other beverages or followed by a shot of something else to get rid of taste as quickly as possible. Our apple cider vinegar has been aged for 9 months in oak barrels before being dried using a new innovative, low-temperature process to bring you organic apple cider vinegar, with the MOTHER (strands of proteins, enzymes and friendly bacteria), in an easy to swallow, non-pungent, no taste, capsule. Garcinia Extreme Liquid contains Pure Premium Garcinia Extract with 60% Hydroxycitric Acid (HCA). Garcinia gained worldwide popularity when it aired on the Dr Oz TV talk show. HCA is known for many benefits, but it most popular with people looking for an aid in weight management. The Southern Cross University (Australia) has completed a series of In vitro and comparative tests of MultiplyPLUS in the human blood. Tests reveal that the Probiotic with MultiplyPLUS (Bio fermented Papaya and Pomegranate) has shown a 37% stronger stimulation of natural killer cell cytotoxic activity (anti-viral) over a standard 25 Billion cfu Probiotic. Using Garcinia Extreme Liquid as a dietary supplement that has come from fermented green papaya improves the effectivity of antioxidant and degradative enzymes, which maintain the enteric environment balance. It also super charges the metabolism and activates immunity. Maqui is 4 times stronger than Acai & Goji berry & has the highest Oxygen Radical Absorbance Capacity (ORAC) value in the super fruits. Maqui Berry protects cells from oxidative stress, fights free radicals, is anti-aging, assists with weight loss, cardiovascular health and it is a good source of Vitamin C and Potassium. Probiotics Aid in digestion and suppression of disease-causing bacteria. They help prevent and treat diarrhoea and treat overgrowth of “bad” organisms in the gastrointestinal tract (a condition that tends to cause diarrhoea and many occur from use of antibiotics). Probiotics may also alleviate symptoms of irritable bowel syndrome (IBS). Garcinia Extreme Liquid is the ULTIMATE ORGANIC UNIQUE SUPER FOOD, high in anti-oxidants combined with a pro biotic punch. It is 200 times more absorbable than a capsule & contains 500mg of Garcinia extract with 60% Hydroxycitric Acid (HCA) per 15ml serve. It is the perfect combination of natural ingredients to maximise inner health to keep your body functioning at an optimum level. Each capsule contains 500mg of naturally fermented Australian organic apple cider vinegar, equivalent to 15ml or approximately 1 metric tablespoon of organic liquid apple cider vinegar. Take 1-2 capsules per day before food and with a glass of water. Store in a cool dry place away from direct sunlight and heat.